Today’s a very sad day for the DomainGang team and for domainers in general. Our friend and regular contributor, Daryl – known as Daryl the Drunk Domainer has passed away. Daryl loved beer, buxom women, and spurting out obscenities about domainers that have no clue about how the domain industry functions. Often times rude but always kind-hearted, Daryl the Drunk Domainer spent his final moments doing what he loved best. It was 4:30am when a monster truck driven by Daryl on highway 27 was cut off by a semi tractor trailer. Daryl’s attempt to avoid the semi resulted in getting on the grassy median and being ejected. He landed face first on a high voltage pole off the side of the road. Ironically, no alcohol was involved in this accident. Daryl was 100% sober at the time of his untimely demise. We appreciate the condolences pouring in since noon today. Daryl the Drunk Domainer will be missed, and so will his personal domain, DrunkDomainer.com – Daryl had sold it a few hours earlier and was partying for his success. We now begin the task of finding a new talent for our weekly rants. Daryl, I love you, man. Rest in peace. Tomorrow we all will be joining you in Domain Heaven. Hope you can share your 72 virgins. Or did he spend everything on beer and domains? P.S. DarylI, I think you would have approved of my gravatar. So sad…never met him but just did a little prayer for him. Rest in peace. Dude was my favorite. RIP Daryl, I’ll drink a beer in your memory. Folks, indeed a sad day for domaining. Daryl will be sorely missed. 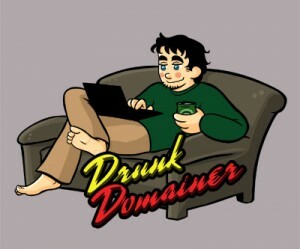 It’s unfortunate that he didn’t have a Domain Legacy contract with DomainGuardians but he sold his only domain, DrunkDomainer.com a few hours prior to having that accident. From what I know, he also partied all the money so he went to Heaven being a happy man. Daryl, You’ll be missed, the only domainer that says it like it is.